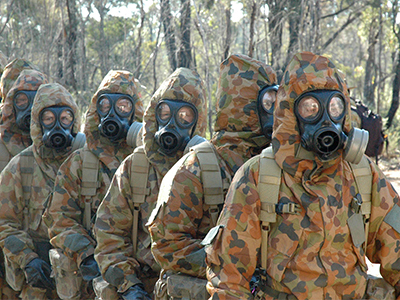 To protect Australia's defence force personnel from the threat of deadly chemical weapons, Defence Science and Technology (DST) researchers have developed ground-breaking nanofibre technology to create next-generation protective suits and respirator canisters for face masks. Chemical weapons can kill and maim indiscriminately, evoking fear among military personnel and civilians. The chemical protective suits and respirators that safeguard military personnel against today's chemical weapons are largely based on early 20th century technology. Designed to protect the wearer in hazardous environments, these suits are too hot for lengthy, unrestricted use – particularly in hot climates. To find a solution, the Australian Defence Force turned to DST, where researchers had already been exploring the potential for using synthetic nanofibres to trap toxic gases, vapours and particles. Working in conjunction with academic and industry partners, DST is nearing the final stages of twin projects which have seen these very clever fibres incorporated into materials that can be used to make next-gen protective suits and respirator canisters. More on these twin projects soon but first, let me tell you a little bit about nanofibres. Nanofibres are synthetic or natural polymer strands, each at least 50 times thinner than a human hair. It's their sub-micron size and the huge numbers of very fine pores between each tiny fibre that gives nanofibres their remarkable properties. Nanofibres have been made from a multitude of different polymers, each with unique physical and chemical properties tuned to make them suitable for a seemingly endless variety of technological applications. Today, nanofibres are used in human tissue engineering and wound healing, cancer diagnosis, drug delivery, the development of powerful lithium-air batteries and optical sensors. They can also be used as filters and it's their air filtering properties that has occupied the minds of the two research teams set up by DST. The first team is developing a fabric incorporating a synthetic electrospun nanofibre layer that keeps out fine toxic particles, the second team is designing a face mask respirator canister incorporating nanofibres which are better able to filter harmful chemicals. Dr David Nielsen is a Defence researcher and team member on both projects, they were undertaken in partnership with Australia's Defence Materials Technology Centre, CSIRO and RMIT, New Zealand-based nanofibre manufacturer, Revolution Fibres, and Australian firms Bruck Textiles and S.E.A. Group. Four separate layers were bonded to create the new fabric. Each was fused together using a highly specialised adhesive layer chosen because it didn't compromise the nanofibre layer's porous quality and would allow the finished fabric to breathe while still filtering particles and gases. The inner and outer fabric layers provide next-to-skin comfort and structural strength, they act as a foundation for the two functional protective layers in between – one a layer of activated carbon, which absorbs and traps certain chemicals, the other a gossamer-thin nanofibre membrane that traps aerosol particles. Dr Nielsen says the objective of the fabric project is to give ADF personnel better protection against chemical threats with minimal extra weight or heat burden, allowing them to operate for longer periods in hazardous toxic environments. Dr David Nielsen: With any protective equipment, if you add more protection you typically add an additional burden of weight or heat to the wearer. While a thick rubber suit provides excellent protection to soldiers, unfortunately they would soon collapse with heatstroke while wearing it. However, the nanofibre technology that we've developed weighs almost nothing, yet it's a very effective filter – at least equal to current materials that are much thicker and heavier. With this new material, the additional heat burden will be very marginal because the very fine pores in the nanofibre layer let air in and moisture vapour out, while trapping the harmful particles. This allows us to add protection without making the soldier feel much hotter. Alison Caldwell: The respirator canisters in face masks have two key elements that protect the wearer: At the front there's a filter that traps dust and other particulates; at the rear is a bed of activated carbon. To develop a more effective filter, DST asked the CSIRO to explore the potential for incorporating an engineered, high-surface material called Metal-Organic Frameworks or MOFs into the air-filtering nanofibres. Although the science is still relatively new, fortuitously the CSIRO had already been working on MOFs at its Manufacturing Division's laboratory in Melbourne. DST research had revealed that absorbents could be incorporated into the nanofibres, which meant that the filter could also remove harmful gases. The canister team is designing a new MOF-based nanofibre filter to compliment the function of the activated carbon by absorbing a wider range of toxic gases – including those used in improvised chemical weapons and industrial applications. At the same time the scientists replaced a portion of the activated carbon in the canister with MOF pellets engineered to remove certain toxic chemicals, thereby broadening the protection capability of the canister with minimal additional weight. Dr Nielsen says exhaustive testing has now shown the new fabric is highly effective at removing toxic chemical vapors and able to efficiently filter particles. To confirm its durability, the material also passed extensive scrunch testing with flying colours. Dr David Nielsen: Using our local partners, we hope to prove that we can scale up this technology and demonstrate that it is feasible to produce the large rolls of fabric required to build prototype suits. We believe the new suit and respirator canister represent technological leaps that will make it possible to future-proof the protection of ADF personnel against chemical threats. Alison Caldwell: Dr Nielsen says the nanofibre-inspired equipment ultimately could be used outside defence, for example by emergency workers responding to chemical spills or other toxic hazards. DST will keep you posted on how these amazing tiny fibres are helping to protect ADF personnel. Keep up-to-date with Australian-led defence science by following us @DefenceScience on Twitter, or download the DST App from Google Play or the App Store. This podcast is a production of Defence Science and Technology, part of Australia's Department of Defence.